The redacted documents were posted on the U.S. National Archives website after President Donald Trump gave his final approval. 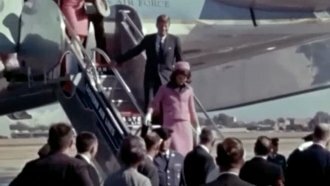 The U.S. government is finally releasing some of the last remaining classified documents about President John F. Kennedy's assassination — but a lot of the information is still going to stay under wraps for the moment. About 2,800 of the thousands of redacted documents were posted on the U.S. National Archives website Thursday after President Donald Trump gave his final approval. Trump revealed on Twitter last week that, barring further information, he would allow the files to be released. And although he confirmed Wednesday they would be published, the government still wants to give the files one last review before they go public. The remaining redactions will stay redacted for at least 180 more days. After that window, a government department will need a specific justification to keep the information sealed. The president had until Thursday to decide whether he wanted to keep the documents under wraps. That deadline was set in 1992 when Congress passed the JFK Assassination Records Collection Act. As president, Trump was the only person able to block the release of some of the documents after he deemed them a risk to security, intelligence or diplomacy. Historians said before the release it's unlikely the documents will reveal any bombshells about the assassination.